The turnout at the recent rally organized by the opposition in central Moscow indicates that the post-election discontent is gradually coming to an end. According to the authorities, about 10,000 people attended the protest, although the opposition claims that Saturday’s rally attracted up to 30,000. On March 10, critics of Russia's current political regime gathered once again in central Moscow, this time on Novy Arbat, to express their support for honest elections. Although some opposition members and and nationalists made attempts to provoke unrest, the demonstrations took place peacefully without serious incident. Left Front leader Sergei Udaltsov tried to lead some 60 activists in an unsanctioned march on the Kremlin from Novy Arbat, but police detained him and other protestors. There was a heavy police presence along the protest route. 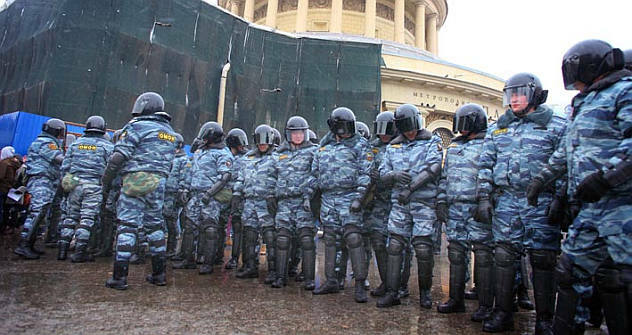 The authorities in St. Petersburg refused to sanction an opposition rally, and 40 activists who attempted to march in the city’s center on Saturday were dispersed by police. Some of the protestors were taken into custody. Likewise, the city government of Nizhny Novgorod cracked down an opposition rally which brought together some 150 participants and the local police detained some of them. Protests also took place in several major cities in Siberia, but only attracted dozens in each case. The Moscow rally was not as large as previous ones, bringing together only about 10,000 people, according to police. Yet the opposition, including Udaltsov, insisted that about 30,000 protestors took to the streets to express their indignation. But even he admitted the turnout at Saturday’s protest was much lower than at previous opposition rallies. This resulted from “the entire Kremlin propaganda machine” which convinced people that the elections were fair, Udaltsov said. The agenda of the rallies hasn't changed significantly since the presidential vote on March 4. The participants continue to claim that Russia's recent elections were conducted unfairly and resulted in a falsified victory for the establishment and Vladimir Putin. They still demand political reforms and a new round of elections for both president and parliament. Read more: A space for dialogue? Udaltsov said that the goal of the protestors was to spotlight the illegitimacy of the elections, and the president. Although a majority of Russians voted for Putin, many illegal practices took place during the vote according to protestors. The violations ranged from the carousel practice of voting repeatedly to ballot stuffing. Protestors argue that this casts a shadow on the legitimacy of the presidential election. Among other prominent speakers who made appearance during the elections were chess player-turned-opposition activist Garry Kasparov, TV presenter socialite Ksenia Sobchak and a number of observers. The protest movement seems to be coming to an end, Sergei Zheleznyak, the United Russian member said in an interview with Kommersant FM. “I’m sure that it is one of the last rallies in this format, because the protest activity is decreasing now and the figures announced by the organizers are not accurate,” he added. Some of the rally’s participants were disappointed by the low turnout. “Nothing will change in Russia for the better until we get at least half a million people on the street,” Yury Rostovsky, a pensioner from Moscow, told RIA Novosti. This report was based on information from Kommersant FM, RIA Novosti and Vedomosti.ru.